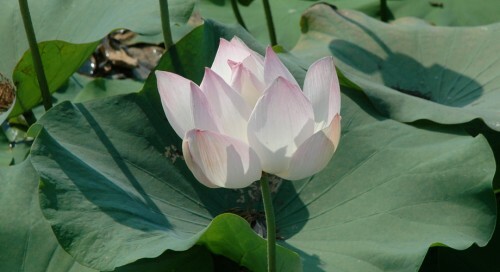 I would like to share with you the gift of a lotus flower, as a reminder of the oneness of us all. The diagnosis of my now 20-year-old son with Duchenne muscular dystrophy at age six, was a catalyst for me to live in the present moment, and to live with gratitude. (Duchenne is a debilitative, fatal, progressive muscle wasting disease that does not affect the mind). For me, it was an awakening and there was an important shift in my thinking. There was suddenly a fierce clarity of the fragility of life. Being completely present stops the mind chatter, the thoughts and opinions, the worry, the past, the future. The moment is transformed into one of peace, bliss, compassion, kindness and love. Our realization of Oneness melts away the feeling of separateness. The lotus flower is a perfect analogy of our human condition. A lotus flower begins growing at the bottom of a muddy, murky pool, and slowly emerges toward the surface, bursting out of the water into a beautiful blossom. During the night the lotus closes and sinks under the water, and emerges again with the sunlight of a new day. The lotus seeds contain perfectly formed leaves as miniatures of what they will become when it blooms. Its stem is flexible but does not break. As the lotus flower emerges from the mud, and up toward the surface it is completely unstained. To me, the lotus in the mud symbolizes the hardships and difficulties of life, or a challenging time we have faced or are facing. As with the stem growing toward the surface, we also grow through our experiences, through our difficulties, learning lessons along the way, removing obstacles and overcoming our adversities. As the petals unfold, we too unfold, and become like a lotus rising from the murky waters and flowering into something beautiful. Its open blossom stands for enlightenment. The lotus seeds, containing perfectly formed leaves symbolize our potential. Its flexible stem symbolizes our resilience. As the lotus begins to emerge, this symbolizes never giving up, never quitting when things seem difficult. The blossom of the lotus flower symbolizes enlightenment, our awareness, and our beauty. During the night, the flower closes and sinks, like a cleansing, and then emerges with the light, a renewal. According to a traditional story, the more muddy and opaque the water, the more beautiful the Lotus flower when it emerges. Namaste. The light in me sees the light in you.